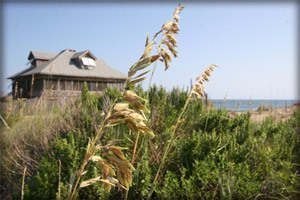 The Outer Banks is centrally located on the east coast of the United States, making it a convenient destination for prospective residents and travelers alike. We’re 1 1/2 hours from Norfolk, Virginia and Norfolk International Airport, where you can connect with major airlines. The Outer Banks of North Carolina lie just 3 hours from Richmond and only 5 hours from Washington, D.C. The Outer Banks maintains a small-town charm with a population of just under 30,000 residents who live, work and play here year-round. There’s another population – the 250,000 people who visit here weekly in the summertime. 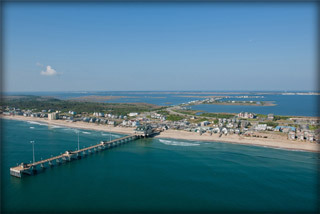 What is it about the Outer Banks? The sun, surf and sand are legendary. Sportsmen come from around the world to fish the waters of the Outer Banks. You can take a deep-sea charter, fish from one of the many piers or simply cast your line from our beautiful coast for some of the best catch found year-round. The 30,000 acres of beaches and the waves of the Atlantic have made Cape Hatteras and surrounding areas a surfer’s paradise and home to many annual surfing competitions. On the dunes of Jockey’s Ridge you can go fly a kite, or be one with hang gliding lessons. Go sailboarding on the sound or birding at Cape Hatteras National Seashore. History buffs will have plenty to see and do. 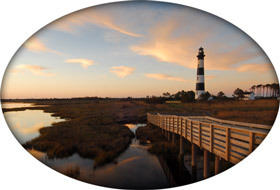 The Outer Banks is an area steeped in the rich history of our nation’s beginnings. The first English colonists landed on the Carolina coast only to become the “Lost Colony,” but not before celebrating the birth of the first English child born on American soil, Virginia Dare, namesake of Dare County. The first flight of Orville and Wilbur Wright took place on the dunes of Kitty Hawk in 1903, marking the Outer Banks as an important place in aviation and transportation history. Visit one of the many lighthouses that have long guided seafaring fishermen safely to shore by day, and spend the evening in one of the many fine restaurants that feature dishes created with the legendary seafood that’s available year-round. I am always available for personal service by phone or email, so please contact me at (252) 202-1043 with questions any time!